Manchester City and Tottenham go head to head in the International Champions Cup this weekend. Fancy BTTS in this match? 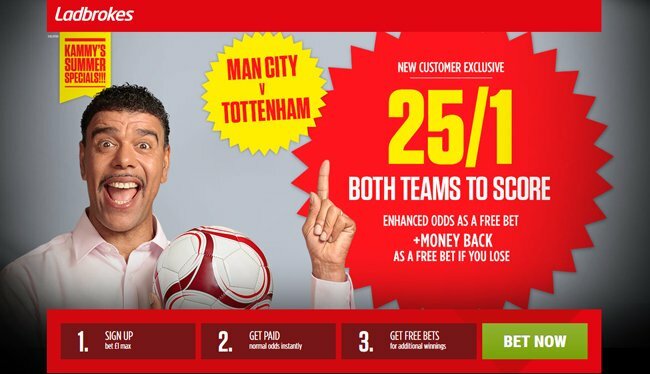 Back Man City & Spursboth teams to score @ 25/1 with Ladbrokes! Money back as a free bet if you lose! Man City and Tottenham both have attacking talent in their side and the ICC 2017 matches have been high scoring affairs so far. BTTS is normally available at 2/5 but you can claim an enhanced 25/1 at Ladbrokes! Risk-free! Join Ladbrokes via our special links and claim 25/1 Man City & Man UTD both to score! 3) Place a single bet of up to €/£1 on Manchester City or Tottenham "BTTS YES" at normal odds in the Manchester City v Tottenham "Both teams to score" market before the kick off. 4) If your selection wins, your account will be credited with extra winning to make payout equivalent to enhanced odds within 24 hours. 1. New Ladbrokes Online & Mobile customers: Simply register today, deposit a minimum of £/€5, and then place your first bet as a single bet of £/€1 on Both Teams To Score in the Tottenham V Man City match. (25/1). 2. Bets placed in accordance with the terms and conditions will be eligible for the enhanced odds of 25/1 on Both teams To Score. Maximum one qualifying bet per customer. 4. This offer is available from 08:00 on Thursday 27th July 2017 until 23:00 Saturday 29th July 2017. "Ladbrokes offer 25/1 BTTS in Man City v Tottenham + money back (ICC 2017 enhanced odds)"